Is muscle pain after exercise a good thing? How can you avoid post-workout muscle soreness? And what’s the best exercise when you’re suffering from sore muscles? So you’ve hit the gym for the first time in a while, or you’ve really upped your game. Now you can barely lift your arms above your shoulders. What happened, and what can you do about it? 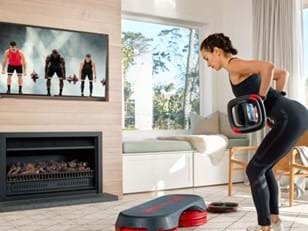 Les Mills Head of Research and Technical Advisor Bryce Hastings sorts fact from fiction when it comes to pain and gain. Is it normal to feel pain in certain muscles when you first start exercising? Yes, some post exercise muscle pain is normal. But the pain should not be too horrific! If we consider a pain scale of 0 – 10, a maximum of 3 out of 10 is acceptable. Another useful rule is that you can expect to feel equal pain on each side of your body. Muscle pain that is significantly worse on one side than the other may indicate something more significant than muscle soreness and therefore needs to be watched carefully and assessed if persistent. What is actually happening to your muscles when you feel sore? It’s generally accepted that the old “lactic acid” theory no longer holds true. Lactic acid, which is produced in the muscle as a result of not being able to get enough oxygen to the muscle fibers due to a high exercise intensity, is cleared from the muscle very quickly. So it cannot be responsible for the pain that worsens over a two-to-three-day period. So what’s the real cause of sore muscles after exercise? Current theories suggest that “delayed onset muscle soreness” – or DOMS – is the result of an inflammatory response due to the microscopic muscle damage that occurs during exercise. It sounds bad, but it’s this microscopic damage that leads to the adaptation within muscle – this is one of the reasons exercise is so good for us. This damage stimulates the muscle to respond by laying down more muscle fibers (increasing muscle tone) and improving the blood supply to the muscle (capillarization), so there is less damage next time we train. Capillarization makes it easier for the heart to get oxygen to your muscles, which is how exercise makes you fitter and improves your blood pressure. What can you do to reduce the likelihood of sore muscles after exercise? 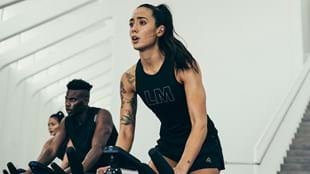 If you’re just starting out or reigniting your fitness journey, the secret is to start slowly and increase the frequency, duration and intensity of exercise gradually over a six-week period. This is why the Smart Start template works so well – it’s designed to minimize muscle soreness and allow the adaptation process to occur with minimal discomfort. We’re told to warm-up and warm-down, but can you do more to avoid strain or pain? Avoiding muscle pain or strain relies on knowing your limits during a workout. If you haven’t curled a bar for a long time, chances are your biceps aren’t going to be too happy when you suddenly subject them to bicep curls for a whole track (which may consist of around 100 reps) in a BODYPUMP™ class. Similarly, you may walk upstairs every day at work, but if you haven’t done anything resembling a jumping lunge since primary school, your quads probably aren’t going to be happy after your first BODYATTACK™ class. 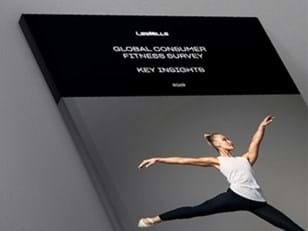 All Les Mills instructors are trained to give options as they coach the workout to make this easier and less painful. Put your ego on hold and take the options. Your muscles will still gain the benefit without the soreness. Put your ego on hold and know your limits. Instructors provide options – so take them! Should you exercise even when you are still sore from a workout? Yes, you can still do some exercise even if your muscles are sore. However, repeating the same exercise that produced the sore muscles prior to recovery is a little risky and it probably won’t seem like a good idea anyway. So, if you are suffering from upper body stiffness as a result of training your arms, chest and back, some leg training will probably be fine. And low intensity cardio training may even help speed up the recovery by flushing oxygenated blood through the recovering muscles. You could try a low intensity RPM™ class the next day, maybe. Is a little muscle soreness always part of pushing yourself to the next level? Elite athletes have an amazing capacity for pain during and after exercise – in fact they crave it. And yes, if you have to improve performance by very small increments to become the world’s best, at times it’s going to hurt. As for the rest of us, exercise doesn’t need to hurt at all, so why push it that hard? When I train I think, I’m going to be doing this for years, so what’s the point in busting a gasket now? Finally, will stretching, rubs, hot baths or saunas really help muscle soreness? Go easy with stretching when your muscles are sore. The inflammation makes them sensitive and an aggressive approach to stretching won’t make them recover any faster. Rubs really won’t help either. Hot baths are okay if you need to get clean, but they won’t help – even with Epsom salts. Saunas, again, not a lot of help for muscle pain relief. My advice? Go for a walk! Whatever you do, don’t repeat the workout that caused your sore muscles!